Yeah, sure, your heavy-duty truck can tow boats and cars and all sorts of trailers. But if you want to really show off your patriotism, you tow a giant flag. That’s what Chevy did to tout the new Duramax 6.6-liter turbodiesel V8 in the 2017 Silverado HD – setting a new Guinness World Record in the process. 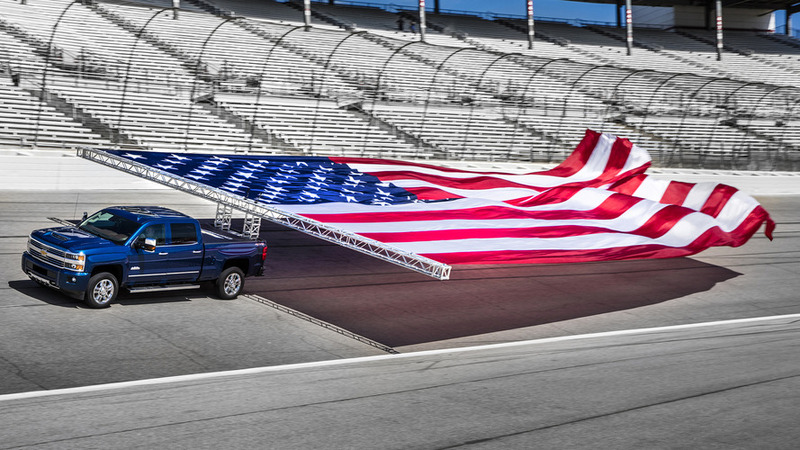 At Texas Motor Speedway, the 2017 Chevy Silverado HD hauled a giant, 40-by-80-foot American flag around the race track to celebrate both the truck’s new engine and the State Fair of Texas. Fittingly, Chevy also had a similarly massive State of Texas Flag on hand. It turns out that hauling an enormous flag by track isn’t exactly child’s play. The flags were too big to deploy automatically, despite special 40-foot mountings on the rear of the truck, so 20 people helped launch and retrieve the flags while making sure they wouldn’t touch to ground. To set the new record, the Silverado HD had to tow the flags at least 100 meters without them touching the ground. In reality, the truck completed four whole laps of the 1.5-mile Speedway. Take that, world record. The new 6.6-liter Duramax packs 445 horsepower and 910 pound-feet of torque, huge increases compared to the outgoing model’s rating of 395 hp and 795 lb-ft. The engine is also available in the 2017 GMC Sierra HD. 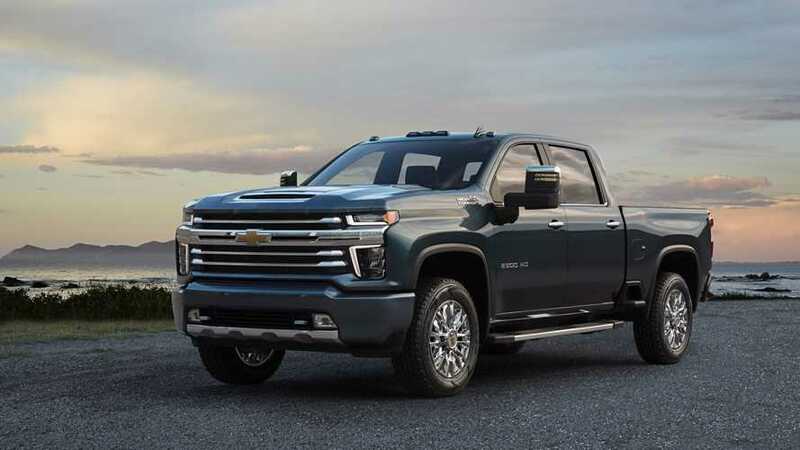 Chevy says that with the improved power, a Silverado 2500 HD can accelerate to 60 miles per hour in as little as 7.1 seconds – 0.7 second quicker than the 2016 model. In other words, plenty quick to haul a flag around a race track. Chevrolet today set the Guinness World Records™ title for the World’s Largest Flag Pulled by a Moving Vehicle, and did it with a 2017 Silverado HD powered by a new, more powerful version of the Duramax 6.6L V-8 turbo-diesel engine. With an SAE-certified 445 horsepower (332 kW) and 910 lb.-ft. of torque (1,234 Nm) — a 19 percent increase over the current Duramax 6.6L — the new engine produces the most torque ever in a Chevrolet vehicle, for exceptional pulling power and effortless trailering and hauling. That includes flying nearly 3,200-square-foot flags. The United States flag flown by the Silverado HD for the record-setting drive measured nearly 40 by 80 feet, with an area of 3,186 square feet. To set the record, the truck had to travel 100 meters (328 feet) without the flag touching the ground. The Silverado more than exceeded that requirement, completing four laps around the Texas Motor Speedway’s 1.5-mile oval. Chevrolet actually created two flags for the event: the U.S. flag used for the world record and a State of Texas flag to commemorate the start of the 2016 State Fair of Texas. Both flags will be on display at the State Fair through Oct. 23. Unique 40-foot riggings on the trucks were designed to fold rearward, enabling the Silverado HDs to quickly enter and exit the track. That design requirement made it impossible to enable a driving roll-out of the massive flags. Instead, a team of 20 people launched and retrieved the flags, ensuring they did not touch the ground. Both flags were pulled by 2017 Silverado 2500HD trucks powered by the redesigned Duramax 6.6L V-8 turbo-diesel engine, offering an SAE-certified 910 lb.-ft. of torque (1,234 Nm) and 445 horsepower (332 kW). The new Duramax 6.6L represents a next-generation redesign, featuring an all-new, stronger cylinder block and rotating assembly, as well as a new, GM-developed control system. The Duramax’s signature low-rpm torque production hasn’t changed, offering 90 percent of peak torque at a low 1,550 rpm and sustaining it through 2,850 rpm, an attribute that contributes to the Silverado HD’s strong, confident pulling power at low speeds. Along with a new camshaft profile and improved cylinder head design, a new electronically controlled, variable-vane turbocharger allows the engine to produce more power with lower exhaust emissions. Its advanced variable-vane mechanism allows greater exhaust temperature capability, enabling the engine to achieve higher power at lower cylinder pressure. Additionally, a new, patent-pending vehicle air intake system with functional hood scoop drives cool, dry air into the engine for sustained performance and cooler engine temperatures during difficult conditions, such as trailering on steep grades. Cooler air helps the engine run better under load, especially in conditions where engine and transmission temperatures can rise quickly. That allows the Duramax to maintain more power and vehicle speed when trailering in the toughest conditions. When towing 23,000 pounds, in 110-degree Fahrenheit ambient temperature, the Silverado climbs the Davis Dam grade 40 seconds quicker than the previous model (3500HD crew cab 2WD with DRW). For customers hauling cargo levels that require a commercial driver’s license, Chevrolet is expanding its line of commercial vehicles with two new offerings: a Low Cab Forward introduced for the 2016 calendar year, and an all-new conventional-cab, medium-duty truck developed with Navistar to be introduced in the future. The all-new Duramax 6.6L will arrive in the 2017 Silverado HD in early 2017.